We’re happy to reward our new and returning customers! Mention this Special when you make your purchase at any of our locations. The Dispensary NV has three locations in Nevada — Las Vegas, Henderson, and Reno — making it convenient our customers to get what they’re looking for! If you’re a medical patient, we have a special offer just for you. We are happy to make your shopping experience and your experience with our products pleasant and affordable. As of July 1st, 2017, anyone 21 years of age with a valid ID can purchase marijuana for recreational use in Nevada. But at The Dispensary NV, we still cater to medical marijuana patients and try to ensure you receive the best possible experience in our stores. 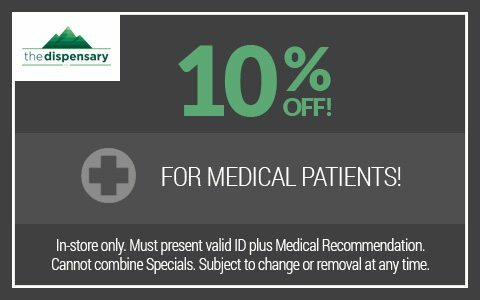 When you stop by any of our three locations — Las Vegas, Reno, and Henderson — simply present this coupon with your doctor’s recommendation and you can save 10% on your cannabis products. Our knowledgeable staff is here to help you find what you need to feel better, in a way that suits your specific medical needs. poor appetite and weight loss caused by chronic illness, such as HIV or nerve pain. If you suffer from any of the aforementioned ailments — or another condition which marijuana may ease the symptoms of — you may want to speak with your doctor about the possibility of cannabis treatment. If you are over 21, you can also come to our shop with a valid ID to find a product that may help ease your pain or discomfort from various medical conditions. Though it never hurts to speak with your doctor first. And a recommendation is required to take advantage of this discount deal. However, you choose to go about purchasing your cannabis products with The Dispensary, know that our lab tested products are always of the highest quality. Unlike private sellers, we provide a clean, safe and secure environment for you to browse and purchase your cannabis wares. Choose from our wide variety of products, including flowers (Sativa, Indica, and Hybrid), edibles, concentrates, topicals, pre-rolls, and more. You can easily find something that is not only beneficial to your health but is enjoyable to use and fits your specific tastes. For any questions about our products, or about Nevada cannabis laws, see our FAQ section online or speak with a member of our team today. Call, or simply stop by a location nearest you.